The following are court results for the Observer area from Hastings Magistrates’ Court from January 19 - January 25. Victor Burrell (aged 31), of Cornwallis Gardens, Hastings pleaded guilty to causing £1,155.93 damage to a window at Sainsbury’s, Station Approach, on December 15. He also pleaded guilty to two charges of assault by beating at Sainsbury’s, on the same date, and to damaging two cans of Jack Daniels and Coke, valued at £3.20. The court made a community order and fined him£25. He was also ordered to pay a total of £300 in compensation. Ethan Fuller (aged 18), of Bristol Road, St Leonards, pleaded guilty to being in possession of a quantity of cannabis. The offence took place at Hastings on August 22 last year. He also pleaded guilty to being in possession of an offensive weapon (a pepper spray) on the same date. He was committed to Lewes Crown Court for sentencing and released on unconditional bail. Levi Jones (aged 35), of Buckingham Road, St Leonards, pleaded guilty to driving while unfit to drive through drugs. The offence took place at Mount Pleasant Road, Hastings, on November 17. He was fined £120 and banned from driving for 20 months. William Jordan (aged 22), of Ditchling Drive, Hastings, pleaded guilty to assault by beating. The offence took place at Fairlight Road, Hastings, on August 26 last year. He was fined £100 and ordered to pay £100 in prosecution costs. Mohammed Krimi (aged 27), of Warrior Square, St Leonards, pleaded guilty to driving without due care and attention. The offence took place at Bohemia Road, Hastings, on October 11. 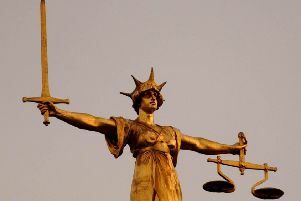 He also pleaded guilty to taking a BMW car without the owner’s consent, on the same day, failing to stop after an accident where another person was injured and driving with no licence or insurance. He was banned from driving for 18 months and ordered to pay £300 in compensation and prosecution costs of £200. Daniel Berry (aged 34), of West Hill Road, St Leonards, pleaded guilty to stealing a gift box worth £85 from the Body Shop, at Hastings, on December 6. He was sentenced to one day’s detention in the courthouse and ordered to pay £85 in costs. Zarene Legge (aged 30), of Meadow Crescent, Bexhill, pleaded guilty to being in possession of a quantity of cannabis. The offence took place at Bexhill on October 26. She was given a two year conditional discharge. Dawid Bychowski (aged 25), of Greenfields Road, Reading, Berkshire, was found guilty of assaulting a woman by beating her. The offence took place at Bexhill on August 14 last year. The court made a community order with a requirement of 100 hours of unpaid work and ordered him to pay £200 in prosecution costs. Aaron Bailey (aged 37), of Deepdene Gardens, Hastings, pleaded guilty to driving a Vauxhall vehicle while three times over the drink drive limit. He gave a breath alcohol reading of 105 microgrammes. The legal limit is 35mg, The offence took place at Deepdene Gardens on January 7. He also pleaded guilty to being in breach of a suspended sentence, passed by Lewes Crown Court on December 9 for being in possession of a Class A drug with intent to supply. He was committed to Lewes Crown Court for sentencing and released on unconditional bail. Susan Harris (aged 55) of Richland Close, Hastings, pleaded guilty to two charges of being in breach of a restraining order by sending text messages. The offences took place on November 2. She was fined £200. Benjamin Reade, 18, of Lower Lidham Hill Farm, Guestling, pleaded guilty to stealing two bottles of brandy worth £12 from Marks and Spencers at Hastings, on January 10. The court made a community order with a requirement of 40 hours of unpaid work. Claire Renalds, (aged 31), of Jevington Gardens, Eastbourne, pleaded guilty to entering the Azur, at St Leonards, as a trespasser, on August 12 last year and stealing 11 bottles of alcohol and a Vectron till to the value of £1,928. The court made a community order with a drug rehabilitation requirement and ordered her to pay £1,958 in compensation. Craig Stanbridge (aged 25), of Harrow Lane, St Leonards, pleaded guilty to a charge of wasting police time by knowingly making a false report that an offence had been committed. The offence took place at Hastings on December 13. He was given an 18 month conditional discharge. Dean Walker (aged 29), of no fixed addressed, pleaded guilty to being drunk and disorderly at Warrior Square railway station on January 7 and to assaulting a police officer on the same date. He also admitted to being in breach of a suspended sentence, imposed by an earlier court for an offence of threatening behaviour. The court made a community order with requirements for alcohol dependency treatment and 14 hours of unpaid work. Tina Williams (aged 51), from St Austell, Cornwall, pleaded guilty to driving a Mercedes car at New Lydd Road, Camber, on January 11 while over the drink drive limit. She gave a breath alcohol reading of 51 microgrammes. The legal limit is 35mg. She was fined £100 and banned from driving for one year.